WASHINGTON - Trans-fats, which are being phased out of food because they clog arteries, may raise the risk of getting breast cancer, European researchers reported on Friday. They found that women with the highest blood levels of trans-fats had about twice the risk of breast cancer compared to women with the lowest levels. Trans-fats or trans-fatty acids are made in creating artificially hardened fats in the process of hydrogenization, for instance. They were, ironically, meant to be healthful replacements for artery-clogging saturated fats such as butter and lard. Veronique Chajes of the French national scientific research center at the University of Paris-South and colleagues studied women taking part in a large European cancer trial. They looked at blood samples collected between 1995 and 1998 from 25,000 women who had volunteered to report on their eating and lifestyle habits and then be followed for years to see if they developed cancer. They studied 363 women diagnosed with breast cancer, comparing their blood levels of fatty acids with those of women without cancer. 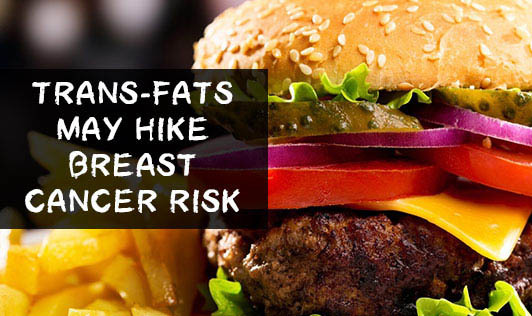 The higher the levels of trans-fatty acids, the more likely a woman was to have cancer.